Reports of not one but two leopards from the previous evening had led us to the banks of the dry Maxabene riverbed for our morning pursuit. Knowing all too well that hyenas may have stolen the impala ram kill that the leopards were feeding off on the ground, I was secretly just hoping that we would find one leopard at best. Tracker Bennet stopped me – leopard tracks. Hyena tracks too… The evidence was all pointing to the leopards having lost the kill. 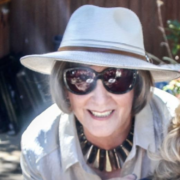 And they had – ranger John Mohaud soon confirmed this. I thought the worst – the leopards had probably split up and gone their separate ways. Off we set following the tracks, which conveniently had been left all along the road. Upon closer inspection, the male and female had been walking side by side, judging by the size of the tracks. “Great!”, I thought to myself… Maybe the pair of leopards had stuck together after all, possibly falling head over paws for each other for a few days as the female goes through her oestrus cycle. 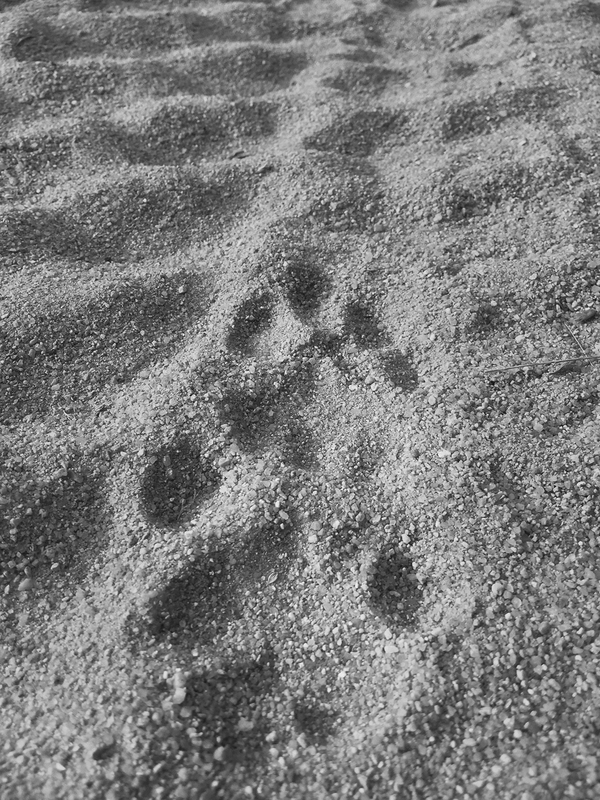 Leopard tracks… The evidence left behind in soft sand, pointing us in the right direction. “Stations, audio of what sounds like a pair of leopards off Inyathini South, west of Hobbit’s Hole road,” called Bruce Arnott over the radio. My heart skipped a beat – this was less than 200m in front of us. The tracks that we were busy following were leading in a straight line towards the sound Bruce had heard. I put my foot down and within seconds found ourselves next to Bruce. A quick discussion and we both turned off the road towards a drainage line – a perfect place for a pair of leopards to be as the morning heats up. And there they were… A brief yet exciting track-and-find. 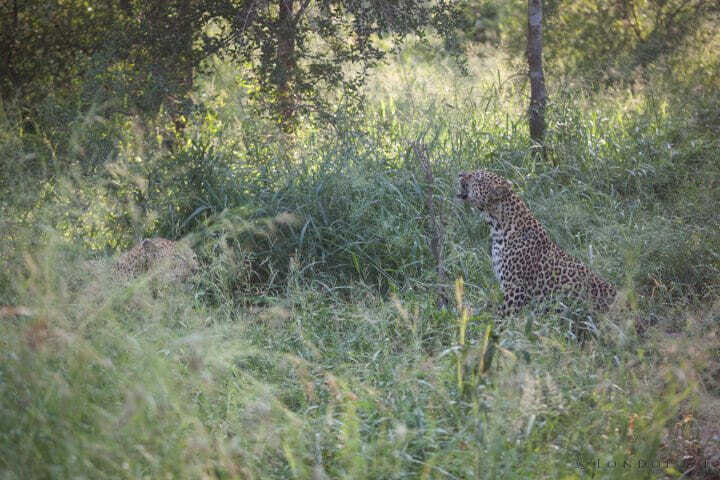 Our first glimpse; the Inyathini male (foreground) faces off against the Ndzanzeni young male. Father and son, within a few metres of each other. But wait – there were more. Three leopards! As we called it in on the radio, a fourth leopard joined the scene! Aren’t leopards supposed to be solitary? Clearly not today. The Inyathini male, Mashaba female, Three rivers female and Ndzanzeni young male. All sitting next to each other looking at us. Not a bad way to start the day! 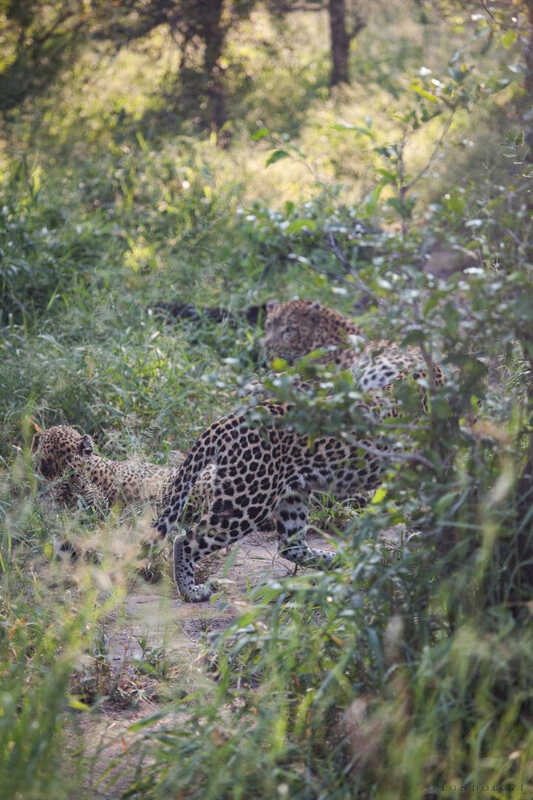 Four leopards within feet of each other… An unbelievable scene! 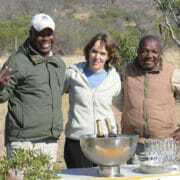 From left to right: The Mashaba female, The Ndzanzeni young male, The Inyathini male and The Three Rivers female. A quick cellphone shot taken by tracker Bennet Mathonsi. This is an incredibly unusual scene to come across. The Inyathini male is the father of the Ndzanzeni young male, hence a possibility as to why the young male was being tolerated. Size-wise, the Inyathini male still triumphs over his son, so maybe the father did not feel too threatened. 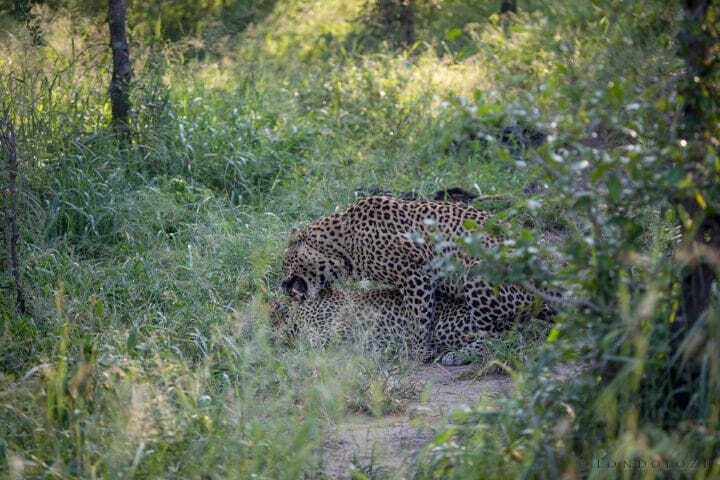 However, the Ndzanzeni young male is no small leopard anymore and will likely be pushed away from his father’s territory any day now, particularly if he starts competing for mating access with females. With the Inyathini male’s territory covering most of the southern section of Londolozi, it is unlikely that father and son have encountered each other all that often, possibly why the Ndzanzeni young male has not yet fully dispersed. The two females were not as happy with each other’s presence as the males were. The guttural growls were quite bone chilling. Rightly so, as they are two completely unrelated leopards. This means that they have no shared genes and are therefore competing with each other to continue their respective genetic lineages. 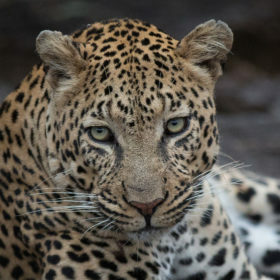 The smallest of the four leopards – The Three Rivers female. 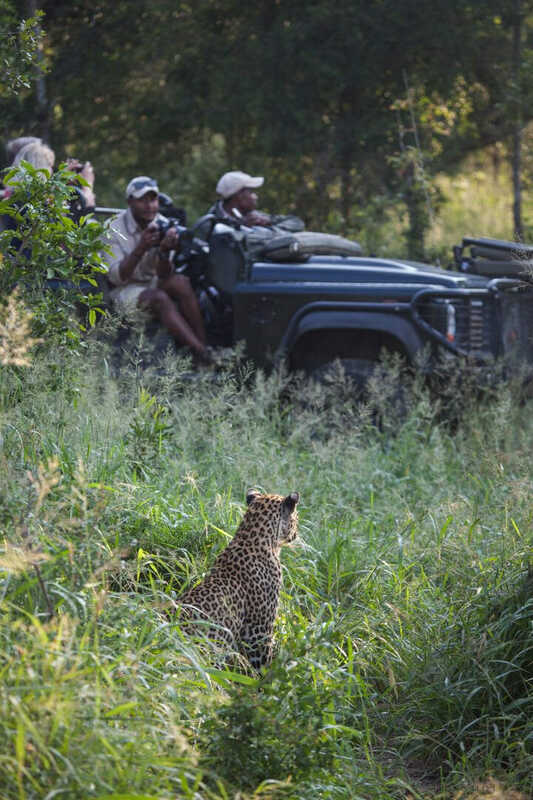 She sat and looked on towards the other three leopards, which were sitting in front of ranger Mrisho Lugenge and tracker Tshepo Dzemba’s vehicle. During my time at the sighting, the Mashaba female – markedly bigger than the Three Rivers female – mated with the Inyathini male several times. Interestingly, each time the Three Rivers female approached the Inyathini male, he would growl at her – as would the Mashaba female. The Ndzanzeni young male was seen mounting the Mashaba female later on in the morning, however ranger Greg Pingo tells me he is uncertain whether any insemination occurred or not as the female’s response was extremely passive, a completely different reaction to when she mated with the Inyathini male. 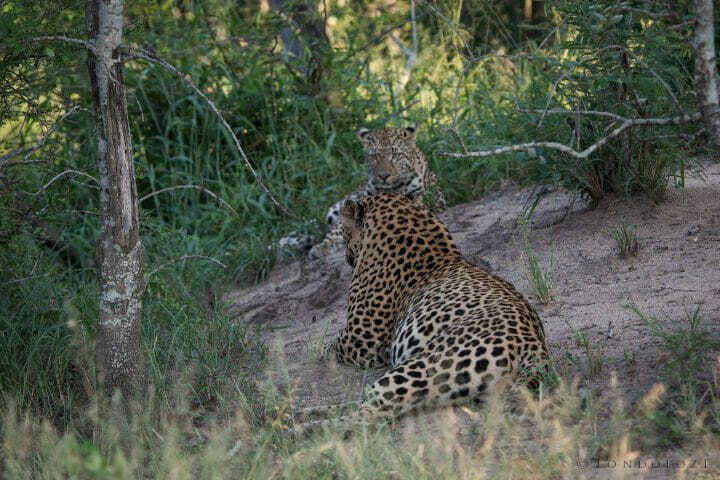 The Inyathini male mating with the Mashaba female. The other two leopards were watching from either side of this pair. A lot of growling and scent marking occurred between the two females the entire time. The Mashaba female was acting particularly aggressively, hissing and snarling each time the younger female moved – quite often trying to position herself between the Inyathini male and the Three Rivers female. The Mashaba female rubbing against a small sapling in order to leave her scent from glands in her cheeks. This is typical territorial scent-marking behaviour. The Three Rivers female flehmen grimaces as she analyses the scent that the Mashaba female (left) had left on the sapling. Shortly after this the Three Rivers female rubbed against the same stump in an attempt to cover the Mashaba female’s scent with her own. This was repeated by each female several times on the same spot – typical of a territorial encounter between individuals. The Mashaba female (middle) positioned herself between the Inyathini male (back) and the Three Rivers female (standing). The Mashaba female growled and snarled aggressively every time the Three Rivers female moved around. The Mashaba female has sadly, definitely lost her litter of cubs born over Christmas. The Mashaba female is extending her territory out of the area west of the Londolozi camps and pushing into new males’ and other females’ territories further in the south-east. The Three Rivers female is trying to establish territory on Londolozi in the areas that were previously occupied by the deceased Tamboti female. The Ndzanzeni young male is trying to mate and will surely be seen establishing a territory of his own soon. Whether this be over part of his father’s territory (unlikely due to the risk of inbreeding with related females) or not only time will tell. There have been cases of father and son mating with the same female at the same time before on Londolozi. These so-called solitary leopards never cease to amaze us here. Who knows what goes on during the hours and hours that we are not with these creatures…? Amazing sighting. To see not one but four leopards together is special. Interesting dynamics going on here! This is an intriguing story to follow up on! Absolutely exciting! Only at Londolozi! I could just about hear the growling and snarling, Pete! Btw, is the Three Rivers female the daughter of Tamboti? Xidulu? Three Rivers is the daughter of the late Xidulu female. Wow! Wow and another Wow!! That’s absolutely amazing! Such a great read!!! So many things that shouldn’t happen and yet right there it’s unfolding!!! As unusual as it is to spot two unrelated leopards together, finding four in one’s viewfinder must have felt extraordinary! We are envious but once again convinced that Londolozi is definitely “Leopard Central”!!! What a wild sighting! Is the three rivers female the same as the xidulu young female? Yes that’s her. She has a very obvious 2:2 pattern with the rear spot on each side, much larger than the front one. Hope all is well. First of all it’s heart breaking that the Mashaba female lost her cubs, especially since each one is precious to the leopard re-population. Secondly, 4 leopards in one place, two of them mating?! That’s insane. What an experience. The photos are a good descriptor of the events, even the cell phone image. Always good to have a mobile phone backup. I can’t imagine everyone’s amazement when first realizing there were four leopards closely together AND remaining together for some time!! The stories behind each leopard is fascinating and now they are creating another story that will be retold to other guests in the future. Goes to show how strong the instinctive need to mate is which caused the four to allow each other’s presence. If the ladies are interested, the males will gladly stay and comply. So sad to have it confirmed Mashaba lost her Cubs, but gratefully others may be on their way to rebuild Londolozi’s population. This was a wonderful and surprising occurance! Is 4 adult leopards together a record? I remember seeing a blog some time ago with a picture of 3 (Camp Pan, his son Tu-Tones and a female, can’t remember which one), but this must be extremely rare. How lucky for you and your guests! Do you think the Ndzanzeni young male was watching for some courtship tips from his father?! 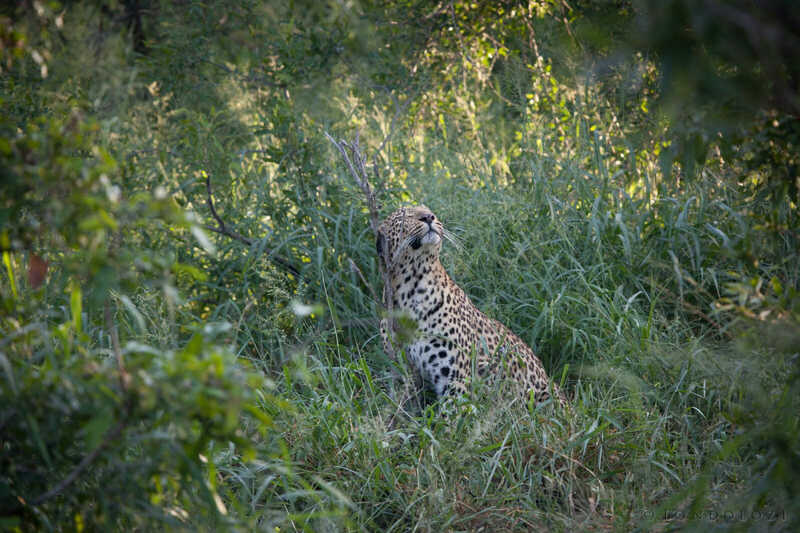 – he was after Mashaba when I came last October , following her scent and vocalising. He’s got the looks, but has he got the touch? Haha, he (The Ndzanzeni young male) definitely has the looks, although I’m not sure that’s what the females are after… Rather size, strength and a willingness to defend a territory. I have seen four leopards together in the same place once before, however it was the Nhlanguleni female with her two cubs at a kill, together with the Anderson male. In that case it was two cubs and two adults – quite different to the four adults we witnessed in this particular sighting! Great blog and images – as always. In preparation for my upcoming safari to Londolozi later this year, it would be helpful if you and your colleagues would include what actual lens you used, rather than just the mm setting. 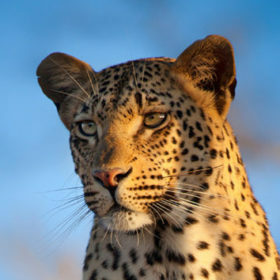 For example, in the first Leopard image, it is 235mm, but what lens did you use? Thanks for considering this; with so many great choices for zoom lenses, this information will help me, and I suspect other, in determining what to pack in my camera bag. Thanks for this suggestion – definitely a good one. The camera settings displayed are an automated function that we have started using in the blogs. I will follow up and see whether it is possible for the lens information to automatically be included too. For your information though, I use a canon 100-400mm (f5.0-f5.6). Yet another Londolozi leopard surprise!! It makes sense there’d be more aggression between the two unrelated females than between father and son. The Mashaba Female has been having really bad luck with raising cubs recently. That’s such sad news that she lost her Christmas litter.